The dockyard steadily grew and by 1800 it consisted of two dry docks, two slips and around 30 buildings. It was soon realised that the present dockyard was struggling to keep up with the work expected of it, the building were badly placed and room was short. With this in mind it was decided the dockyard needed a complete overhaul. John Rennie was asked to survey and design a completely new, state of the art dockyard starting from scratch. Work began on 23rd December 1813 with the first piles being driven. In total the works cost £2,586,063 and took 10 years to complete. 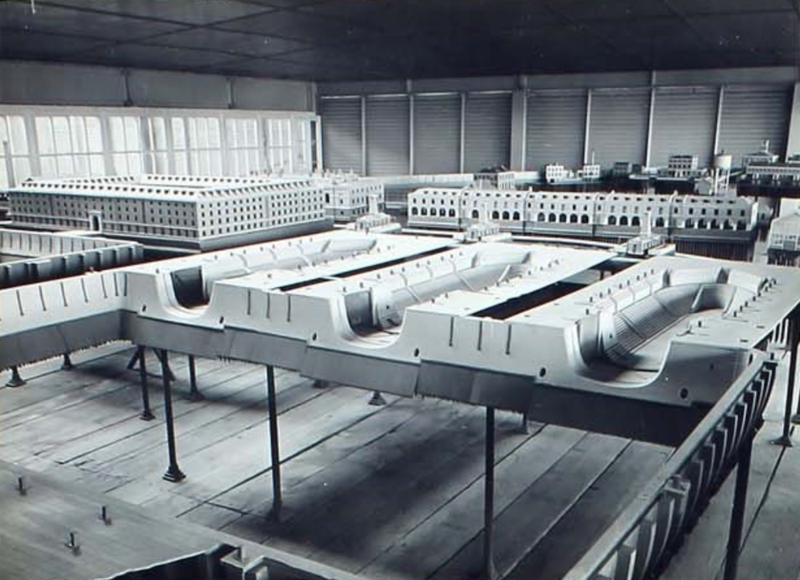 To demonstrate Rennie’s design, the whole Dockyard plan was reproduced in miniature, modelled in wood to show the entire layout with each building meticulously detailed. This model, covering 1600 square feet survives intact in the custody of English Heritage today, and will be found a permanent home in the Dockyard Church as part of the restoration. The docks were re-opened by HRH the Duke of Clarence on 5th September 1823 and Howe, a 1st rate ship, was floated into No.1 dock as part of the ceremonies. During this works, in 1816, dockyard workers set up the Sheerness Economical Society to buy food in bulk to distribute to other workers and their families at a reduced cost compared to local shops. The company Joliffe and Banks (Sir Edward Banks) were contracted to build a number of buildings including the Captain-Superintendants House, the Admirals House, to be the home of the Commander-in-Chief The Nore and Naval Terrace to name a few in 1827. Sheerness Dockyard was the scene of a riot in 1830 after a Warden accused one of the workers of being in possession of the 'Kings stores'; as he was leaving the dockyard to go home. A large number of workers heard this accusation and tried attacking the Warden. Three Constables and Commissioner Lewis attempted to get the Warder to the safety of his home but by the time they reached the Barrier Gate they realised that the Military Guards had to be called to help, by this time Commissioner Lewis had been struck with thrown stones and bricks. The worker, a mechanic, pleaded guilty to theft at his trial and was fined and discharged from the Yard. Eight years later the Temeraire, a 2nd rate ship, fired her guns for the last time as a 21 gun salute for Queen Victoria's coronation on the 28th June. Moored at the Nore, the crew were treated to a double issue of rum and shore leave to Sheerness as part of the celebration. The ship Actaeon was commissioned at Sheerness as a Torpedo School on 6th June 1905, she was later moved to Chatham. Four years later in June 1908 the gunnery school, HMS Wildfire, was closed and all courses were moved to Pembroke although the firing range remained in use. The same year Agincourt, a battleship, arrived at Sheerness Dockyard to be stripped and converted into a coal hulk. 1000 extra labourers were hired to help in this task and she was later moored just off Sheerness until Trafalgar Day in 1960. On the 10th January 1912 Sheerness was involved in another history making exercise when the battleship Africa was moored off the dockyard, her purpose being the first Royal Naval warship to launch an aircraft, a Shorts S27 seaplane from a ramp over the forward gun turrets. In 1914 and 1915 two ships exploded causing a great loss of life off the coast of Sheerness, both were unfortunate accidents. Before and during WWII ships entering the River Medway were ordered to remove all their ammunition at Sheerness Dockyard so to prevent any serious and damaging explosions at Chatham Dockyard or near the Ordnance Store at Upnor. The dockyard was still in use during this time repairing and making adjustments to ships, it also played a vital role during the Dunkirk evacuation with many small boats being brought to Sheerness to be checked over by the Navy. It was here they were provided fuel, rations and charts and arranged in convoys before they were sent to Ramsgate before entering the deep waters on a dangerous mission to save all they could from the beaches of Dunkirk. The 18th February 1958 brought bad news to the dockyard workers when an announcement from the Government confirmed the dockyard at Sheerness was to close, they had two years to find alternative employment. Fortunately the dockyard remains open to this day and its owners, Peel Ports, announced in 2015 plans to expand its operations and regenerate the area.